In Virginia, since 2010, driving more than 10 miles per hour (mph) over the top speed limit can get you charged with a criminal reckless driving and land you in jail for up to a year and fined up to $2,500. This is a textbook case of over-criminalization and is an abuse of governmental power. You read that right. Virginia’s top speed limit is 70 mph on interstates. But by law, driving over 80 mph can get you charged with criminal reckless driving — just 10 mph over the posted speed limit. Simply stated, driving with the flow of traffic on an interstate makes you a criminal in Virginia. That’s nuts! Frontiers of Freedom launches a major effort to stop over-criminalization — Stop Convicting Soccer Moms. Virginia criminalizes driving only 11 mph over the speed limit on Virginia’s freeways. This makes criminals of otherwise law-abiding citizens. Over criminalization is a growing problem. Government at every level continues to grow larger and larger and continues to look for new things to regulate, mandate and punish. One example of this crazy over criminalization trend is in Virginia, driving in excess of 80 mph on a freeway with a 70 mph speed limit can make you a criminal and subject you to a year in jail and a criminal fine of $2,500. Driving on an open freeway, the flow of traffic is typically somewhere between 78 and 85 miles per hour. Let that sink in — driving with the flow of traffic on a freeway can make you a criminal and you can spend up to a year in jail and receive heavy criminal fines of up to $2,500, plus thousands in legal fees. Making criminals of soccer moms for driving a little too fast is an abuse of power. Traffic fines are to be expected, but jail time and criminal fines should be out of bounds for something that virtually everyone does. Such a law is compelling evidence of a government that no longer serves the public interest, but is instead looking to pad government coffers and advantage trial lawyers. The government should be serving and protecting law-abiding citizens — not finding new and corrupt ways to convict soccer moms of absurd so-called criminal offenses. 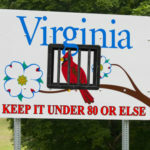 Frontiers of Freedom wrote on the injustice of surprising motorists with criminal charges for what most people would think is only a modest speaking ticket and within a few weeks Virginia started posting signs warning of the criminal penalties. While we are glad to get the attention of Virginia politicians, it is outrageous to criminalize simply exceeding the speed limit as virtually every driver even grandmothers and soccer moms. The law needs to be changed. We don’t need more signs warning us of an unjust and corrupt law. We are shocked that neither Governor McAuliffe nor the state legislature has done anything to reform or fix this abusive law despite it having been raised during legislative sessions for the last several years. We call upon Governor McAuliffe and each and every Delegate and Senator to make it a top priority in the upcoming legislative session to fix this law and treat speeding as a traffic violation, not a crime. Criminal reckless driving should not be the way we deal with simple speeding on a wide-open freeway. Reckless driving should involve some willful, wanton and clearly reckless behavior — not merely exceeding the speed limit. Courts have recognized that excessive speed alone is not a sufficient element of reckless driving. (People v. Grogan, 260 NY 138, 144, 183 NE 273, 275) Reckless driving should be determined by the facts and circumstances of the situation. For example, excessive speed in a school zone, or dangerously weaving in and out of traffic on a freeway at an excessive speed, or tailgating at an excessive speed could be reckless driving. But simply driving too fast on a wide-open freeway shouldn’t be treated as a crime. It should be a traffic violation with appropriate non-criminal fines. There are other states all across the nation that take a similar approach and criminalize ordinary traffic violations. We ask Americans everywhere to help us stand up against over-criminalization and sign our petition at www.Change.org. Anyone who wants more information can go to our website — www.FF.org, or go to our new website — www.StopConvictingSoccerMoms.org or to our Facebook page — Stop Convicting Soccer Moms. Mr. Landrith is available for interviews by calling Frontiers of Freedom at 703-246-0110, ext. 302. You can download a PDF of the Press Release here.